Dancing On Ice Allstars Final! Hayley and Dan were runners-up! Beth and Lukasz finished third! Tonight the Dancing On Ice Allstars Final came to a close with tears from almost everyone and all the skating couples who took part returning. The winner was Ray Quinn and his dance partner Maria and it was a well-deserved win! The skating pair are the last-ever champions of Dancing on Ice. Olympic gymnast Beth Tweddle and her skating partner Lukasz were eliminated in third place leaving Coronation Street actress Hayley Tamaddon and her skating partner Dan to fight it out with Ray and Maria for the ‘Champion of Champions’ title. The winning pair were the early bookmakers’ favourites to win and received the most votes from viewers after getting a maximum of 40 points for both their routines on the night. Dancing on Ice Highlights Week 9! Engaged Couple Sam And Vicky Left The Competition This Week! Former Eastenders actor Sam Attwater missed out on a spot in the Dancing On Ice final but says that because he met his fiancee on the show he feels like he won. Aw! He and Vicky lost out to competition favourite Ray Quinn and his partner Maria Filippov. The grand final tomorrow will see Ray and Maria, Beth and Lukasz and Hayley and Dan to battle it out to become the ultimate champion of Dancing On Ice! Should be exciting! Dancing on Ice Highlights Week 8! Kyran and Nina left the show this week! Kyran and his dance partner Nina lost in the skate-off to Sam and Vicky as Kyran and Nina skated to Chasing Cars by Snow Patrol and Sam and Vicky skated to Riverdance in a very Irish themed skate-off. Dancing on Ice Highlights Week 6! Gareth and Brianne became the latest to leave the competition on Sunday! Dancing On Ice’s fun theme this week was the year 1984! I love the 80s! Such a fun decade! And after a cheesy, fun-filled night Sam and Vicky and Gareth and Brianne found themselves in the in the skate-off during the results show. Sam and Vicky skated to Dream Catch Me by Faulkner in a bid to stay in the competition while Gareth and Brianne skated to U2’s Beautiful Day in their bid for survival. The judges opted to save Sam and Vicky. Best routine on the night was by Ray and Maria who almost scored a perfect 40. They scored 39.5! So roll on next week! Can’t it be a 60s theme next week and have someone dressed up as Twiggy?! Dancing on Ice Highlights Week 5! Kyran and Ninka vs. Sam and Vicky: Kyran and Ninka win. Bonnie and Andrei vs. Gareth and Brianne: Gareth and Brianne win. Hayley and Dan vs. Beth and Lukasz: Hayley and Dan win. Ray and Maria vs. Suzanne and Matt: Ray and Maria win. The pairs who lost their duels then went up for the public vote in which Beth and Lukasz and Suzanne and Matt were saved leaving the skate-off between Sam and Vicky and Bonnie and Andrei. In the skate-off Bonnie and Andrei decided to skate to Big Spender by Shirley Bassey (My mum and sister used to sing that to me to get me off to school when I was a kid but less of my reminiscing!) while Sam and Vicky chose to skate to Jamie Cullum’s version of Rihanna’s Don’t Stop The Music. After the skate-off the judges chose to save Sam and Vicky. Standout performances from the show for me were Hayley and Dan and Ray and Maria in their duels while Beth and Lukasz stole the individual skating section for me with Bonnie and Andrei been a close second. Dancing on Ice Highlights Week 4! 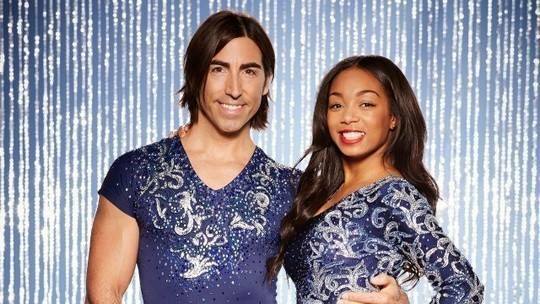 Week 3 of Dancing on Ice seen Zaraah and Andy and leave the competition after a skate-off against Kyran and Ninka. In the skate-off Zaraah and Andy skated to Don’t Cry for Me Argentina while Kyran and Ninka opted to skate to Snow Patrol’s Chasing Cars. Standout performances from the show included Ray and Maria and Suzanne and Matt but Gareth and Brianne were really good too and they could be a dark horse in the competition. Hard luck Zaraah and Andy! You both were really good on the show!